On the evening of Thursday, Sept. 20, a group of students gathered on the front steps of Olin to remember the devastation of Hurricane Maria’s landfall in Puerto Rico. One year ago on that day, the island was hit by Maria, the Category 5 storm that plunged it into chaos and resulted in over 3,000 deaths. Most attendees were dressed in white, as suggested by a post on Facebook a few hours earlier. One student wrapped herself in a Puerto Rican flag. Candles and wax-guards were handed out as a few more figures trickled in. Sure enough, flames seemed to blow out almost as soon as they were lit, prompting students to occasionally re-light their candles from the strangers standing next to them, as they tried to turn away from the direction of the wind. But as Ramos began to speak, students stopped tending to the candles, and followed her voice instead. Ramos began the ceremony by reminding the crowd of the devastation wrought by Maria a year earlier, combined with personal experiences and thoughts. This was followed by a moment of silence for all of those affected by the hurricane, including those still living through its aftermath. Students were then invited to share their work. “Poems, spoken word, or anything else,” Ramos said. Some had prepared speeches, and some spoke spontaneously. One student shared a poem written the day after the hurricane hit last year. Others spoke of their families on the island, including a student recounting her grandmother’s advice to smile through the distance. 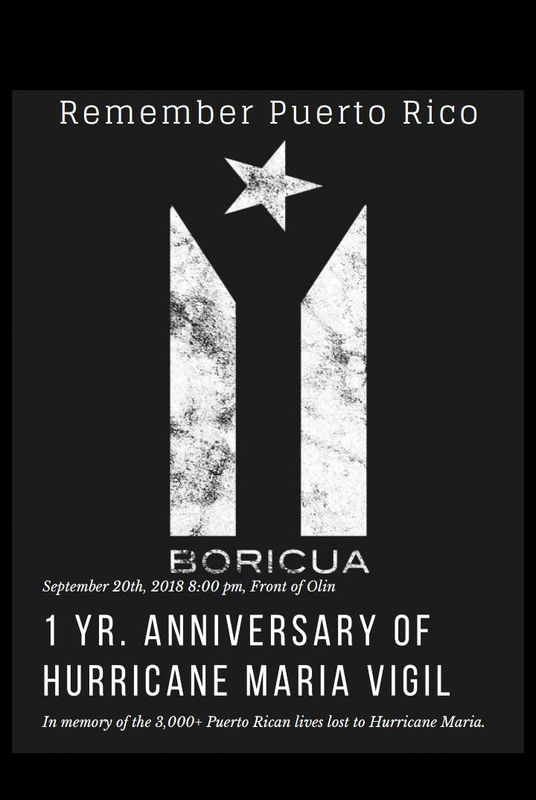 Ramos and Julio Evans ’21, who worked together to initiate and organize the event, purposefully created a nonpolitical ceremony, despite the political baggage that now weighs on the subject of Maria. Instead of turning to politics as it very easily could have, the ceremony focused on individual experiences and the act of remembering a disaster too quickly forgotten. Evans had originally thought of planning a fundraiser, but eventually decided against it, opting for the more solemn tone of a vigil. This much needed act of remembering lay at the heart of the vigil. During the ceremony, Evans told of the frustration of a friend currently living in Puerto Rico. “It feels like those on the mainland have forgotten us,” his friend had said. Though the one year anniversary of the storm hitting the island has sparked an array of articles about its current state, Evans still observes a general forgetfulness about Maria in his everyday interactions. “Aside from Puerto Ricans who know about the problem, I do think that a lot of people are just like, it’s a year, it’s done,” he said. Indeed, amidst more recent news of Hurricane Florence and Typhoon Mangkhut, it is all too easy to neglect the tropical storms no longer at the top of our news feed. News cycles are short, and our attention spans shorter. But a hurricane does not end when the storm has passed; its physical and emotional damage extend far beyond its initial news coverage. Though power was finally restored to the island last month, residents’ lives remain extremely challenging. It is precisely because of this ongoing difficulty that the vigil was so important, and why Evans was so pleasantly surprised by the turnout. Seventy students attended, a significant number, especially for an event only announced about a week in advance. Elodie Frey can be reached at elfrey@wesleyan.edu.